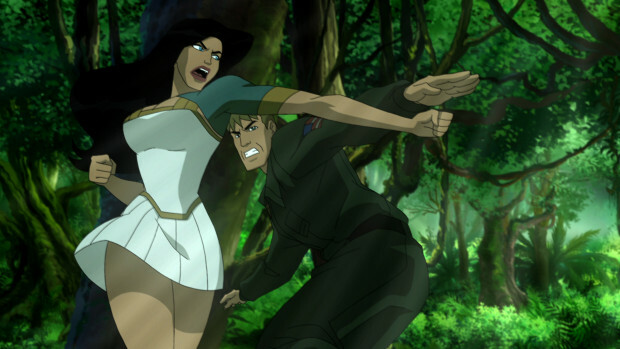 Ground-breaking animation legend Bruce Timm heads an impressive cast and crew as producer of “Wonder Woman,” the next entry in the popular series of DC Universe animated original PG-13 movies due from Warner Premiere, DC Comics and Warner Bros. Animation on March 3, 2009. Warner Home Video will distribute the all-new film, which will also be available OnDemand and Pay-Per-View as well as available for download day and date, March 3, 2009. Fans in the greater Gotham area will have a chance to see the premiere of “Wonder Woman” at New York ComicCon on Friday, February 6 in the IGN Theatre at The Javits Center. Timm will lead the post-premiere panel and also be available for autographs during a midday signing session on Saturday, February 7. Timm is the creative force behind many of Warner Bros. Animation’s greatest modern-day successes, driving DC Comics’ most recognized super heroes to new heights of popularity as the focal point of television series and made-for-DVD films. Timm’s current mission has been as producer of the DC Universe animated original movies, and the first three – “Superman Doomsday,” “Justice League: The New Frontier” and “Batman Gotham Knight” – have met with both critical raves and consumer success. The three-time Emmy Award winner stole a few moments from his work on the next DC Universe film to discuss the evolution of the made-for-DVD movies, Lauren Montgomery’s rise to stardom, his 20-year working collaboration with Andrea Romano, and Wonder Woman’s boots. Gary Miereanu: What progression have you seen through the first four films in the DC Universe animated original movies series? Bruce Timm: The thing I like most about this whole ongoing project is that each of these movies really does have a different, unique feel. It would have been very, very easy and frankly a lot simpler and cost effective to stay in that TV series design style and world view. But each of these movies really does have a unique feel – in the design, the score, the cast, even the title sequences. We’ve been able to expand creatively and that makes these productions fun. Gary Miereanu: You’re known for revolutionizing the animated look of DC characters in several landmark TV series. What was the thought process behind the character design in this film? Gary Miereanu: Were there any specific design elements you wanted to include? Bruce Timm: A character like Wonder Woman is so iconic and yet, over the course of her history, there have been lots of subtle changes. We couldn’t stray too far from the comic book look, but you do have a certain amount of leeway in terms of how you interpret those elements for animation. It sounds really insignificant, but one of the things that we specifically liked about Adam Hughes’ most recent take on Wonder Woman was that he gave her kind of baggy boots – instead of those super tight go-go boot-type things. They kind of flare out at the bottom and they’re flats, not heels. That made her more athletic – it kind of planted her and gave her a solidity that we really liked. It’s a minor change, but it had an effect on her design. Gary Miereanu: What sets Wonder Woman apart from the first three DCU films and prior incarnations of the character? 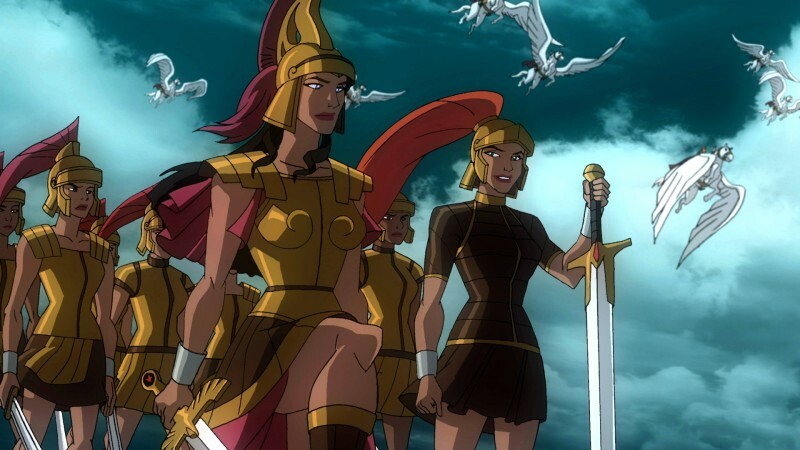 Bruce Timm: One of the things that really intrigued us the most about the whole Wonder Woman mythology is the actual mythology of it. Her character has distinct roots in classic Greek mythology, so we really played that up. The movie actually starts with a fairly long, epic battle that takes place in ancient times. It’s swords and sorcery, die-hard Amazon warriors versus monsters and barbarians. We worked hard to establish the character design, the costume details, the weaponry design and the background styling and I think, within the first 30 seconds of watching the movie, you’re going to think, “Wow, this doesn’t look anything like we’ve done before.” It’s noticeably a quantum leap away from the first three movies. Beyond the mythology, Wonder Woman gets to play with several dichotomies. It’s Amazon culture versus man’s world; ancient mythological times versus the contemporary world; and, of course, all the male and female issues. All of those conflict themes run throughout the entire movie – in the script and visually – and I think it all comes together and gels unlike anything we’ve ever done. Gary Miereanu: How did Lauren Montgomery earn the opportunity to sit in the director’s chair? Bruce Timm: Lauren is one of the fastest rising artists I’ve ever worked with. When we first started working with her on Justice League, she really hit the ground running. She was still relatively inexperienced – she’d only had a couple of jobs in animation at that point – and even today I seem to forget that she’s actually still quite young. But on Justice League, we could see she had a lot of potential and her stuff was really good. Every time she would turn in a new storyboard, we’d be like, “Wow, who did this? This is really good.” And every month, she just kept topping herself. She was really paying attention and obviously on this really fast-tracked learning curve – she was teaching herself, absorbing everything around her. She was this sponge, sucking up all of our perspectives and developing her own unique sensibilities. Within a really short period of time, she became our best storyboard artist. Those are the people we recruit to become directors. Gary Miereanu: What does Lauren Montgomery bring specifically to Wonder Woman? Bruce Timm: Just from a purely practical standpoint, having her as a director means that I don’t have to worry about things. I know she’s looking at the storyboards – and I know she’s going to catch all the little things and fix them. If a storyboard isn’t up to speed with the caliber of the rest of the film, she’s going to stay late and re-draw it herself – and plus it and to make it a thousand times better. She’s smart and very detail-oriented, and very well-rounded in terms of her areas of expertise. That was important on this film. Some directors are really, really good at directing action, but they don’t really care so much about the drama, other directors are the exact opposite. Lauren is excellent at both. She knows how to push the envelope on an action scene, and she’s probably the best director of acting that I’ve ever work with. She’s the complete package. Gary Miereanu: Can you give an example of Lauren Montgomery’s expertise in directing animation “acting”? Bruce Timm: We rely on our storyboard artists to really inject acting into the storyboard drawings as a key for the overseas animators. We’re blessed with really, really excellent vocal performances on these films, but you need a very good storyboard artist to act out the character’s motions and emotions in simple drawings. There’s a short sequence in Superman Doomsday where, after Superman has died, Lois Lane goes to meet Martha Kent for the first time. It’s a very simple, subtle scene – just two women meeting and commiserating with each other over the loss of Superman. It’s shot very simply with two-shots and close-ups. The thing that makes this scene so powerful is the very clear emotion on the character’s faces, and that was the sequence Lauren storyboarded. When you look at it on the screen, it’s as though we got really good actresses giving performances charged with emotion in their specific facial expressions and body language. Ultimately, it was Lauren’s storyboard and direction that really brought that scene to life. Gary Miereanu: Can you define the greatness that is Andrea Romano? 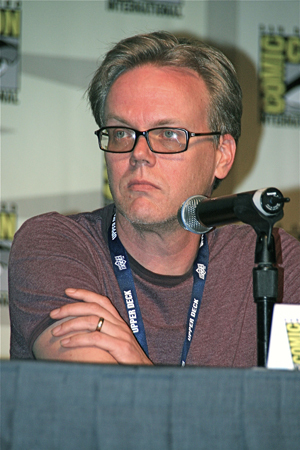 Bruce Timm: What can I say about Andrea that I haven’t said a zillion times before? She’s brilliant. It’s actually tough for me to even compare because I’ve been blessed with Andrea on every single project that I’ve done as a producer since 1990. She knows me so well that half the time I don’t even have to give notes during a recording because she’s already anticipated what I’m going to say. And if do have to say something, I barely get half the sentence out before she finishes the sentence for me. The main aspect of Andrea’s job is that she needs to get performances out of the actors that the producers and directors want. It has to fit our vision of the scene and the film. As dialogue is written on the page, you could have 30 different line readings of any individual line – it really depends on what else is happening in the scene or the intent of that specific line of dialogue. But Andrea has an obvious natural instinct for the meaning of the line. Most importantly, she knows how to translate that information into actor-ese to get that performance. She can put our thoughts into words so that the actors can understand where she’s coming from and what’s needed for the scene. Simply put, she’s great. Gary Miereanu: Andrea Romano’s resume speaks for itself. Does she have a virtue we don’t normally hear about? Bruce Timm: I’ll tell you this – one of the things I love about Andrea is that she’s fast. She just cuts right to the chase, never goes down blind alleys, and she physically talks fast. It’s funny because when I first started working with her, I didn’t think I was going to be able to keep up. She’s just so full of energy, it’s like she must’ve been main lining Red Bull before every session. But that’s great for me, because I’m very ADD myself. She doesn’t equivocate, she’s just right to the point – attack, attack, attack, get it done. For me, that’s perfect.